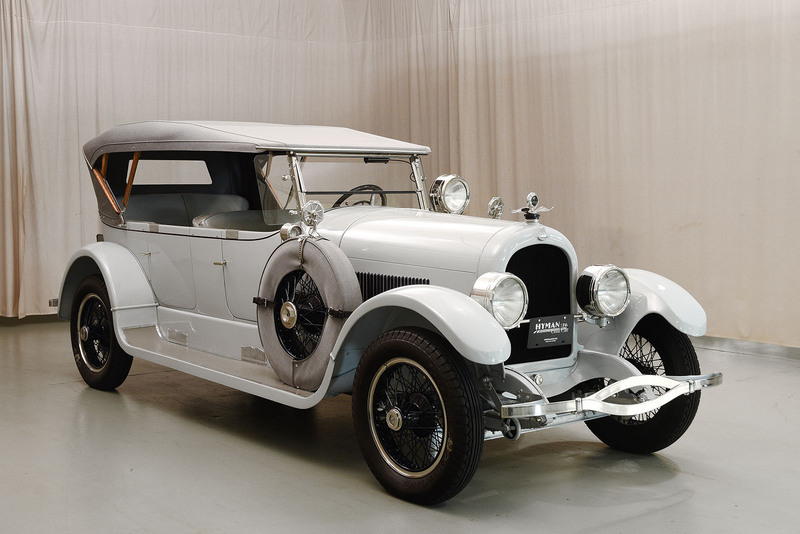 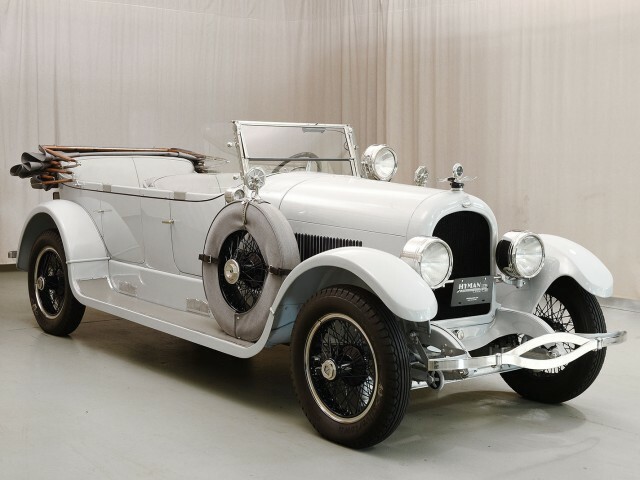 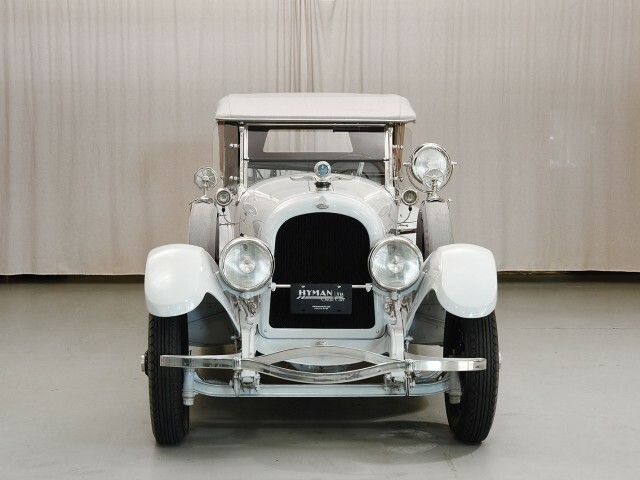 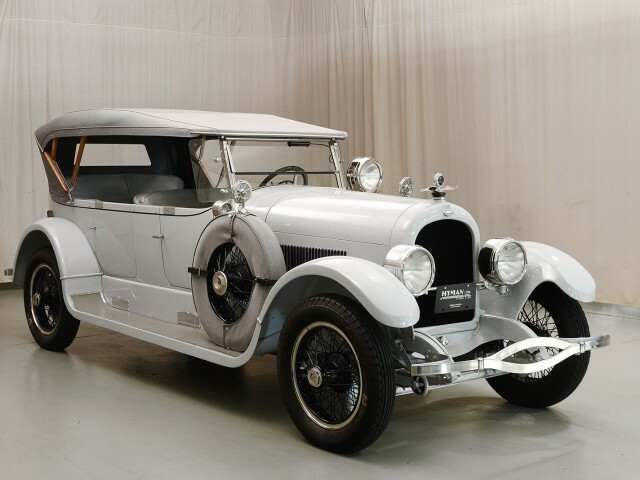 If someone were asked to name the greatest and most advanced car companies of the early 20th century, names like Duesenberg, Packard and Cadillac might come to mind. 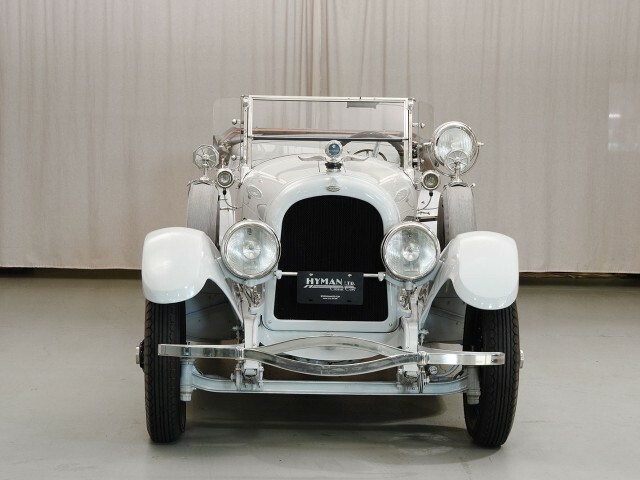 But there were a great many others that showed flashes of brilliance before fading into obscurity. 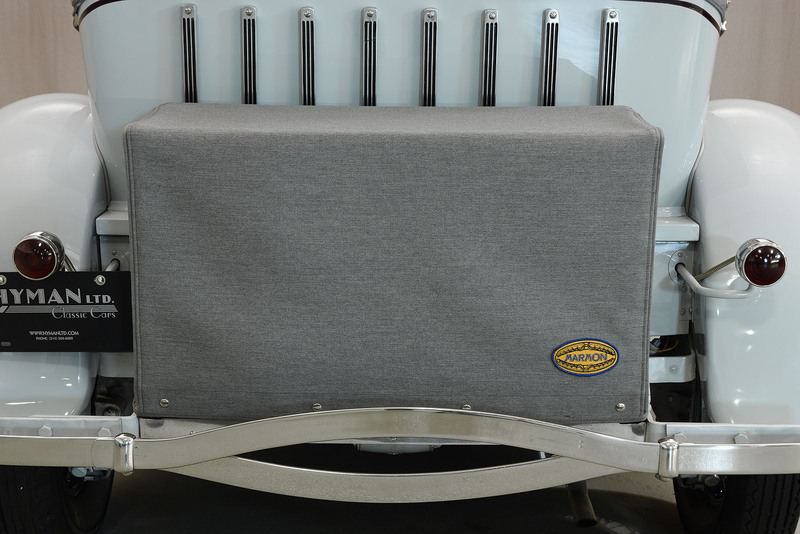 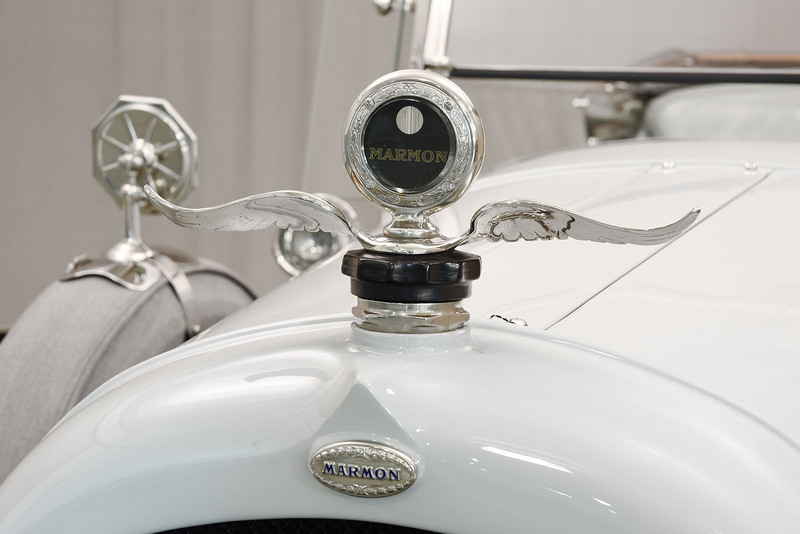 Indianapolis-based Marmon Automobile Company is one that falls into the latter category. 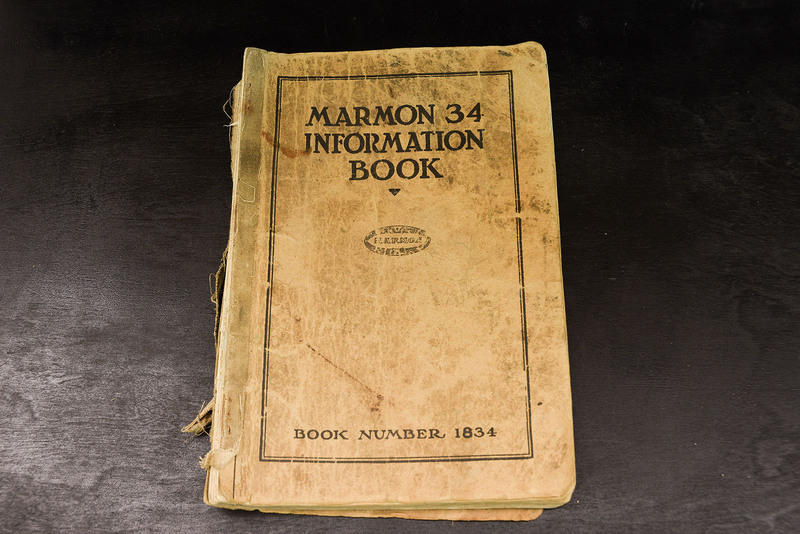 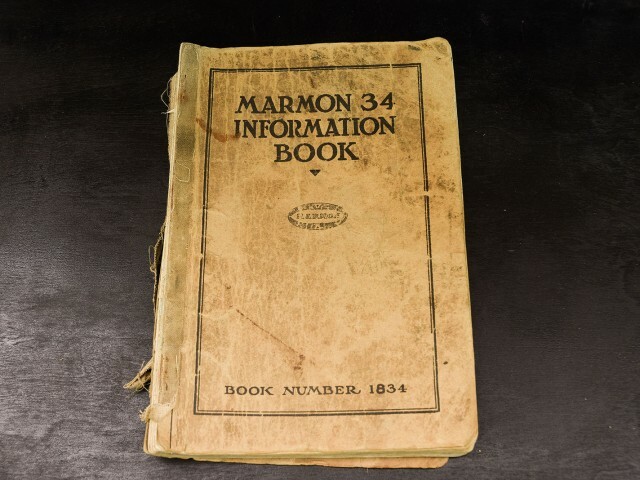 Marmon began life in the late 1800’s supplying equipment for grain milling operations, and eventually diversified into electrical equipment, until that division of the company was sold to General Electric. 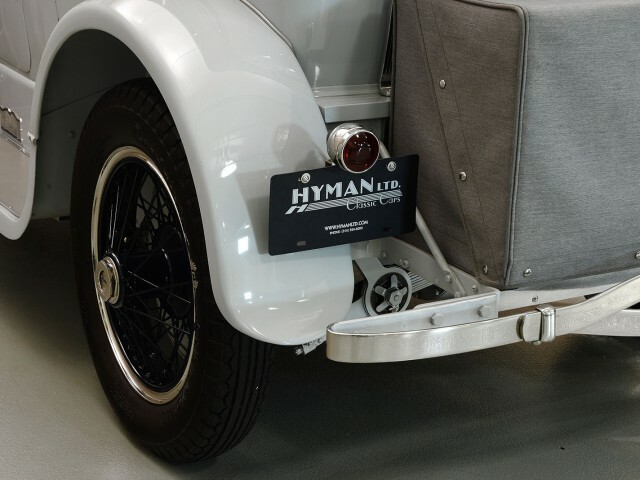 At the turn of the 20th century Howard Marmon, son of founder Daniel W. Marmon, joined the ranks after earning an engineering degree. 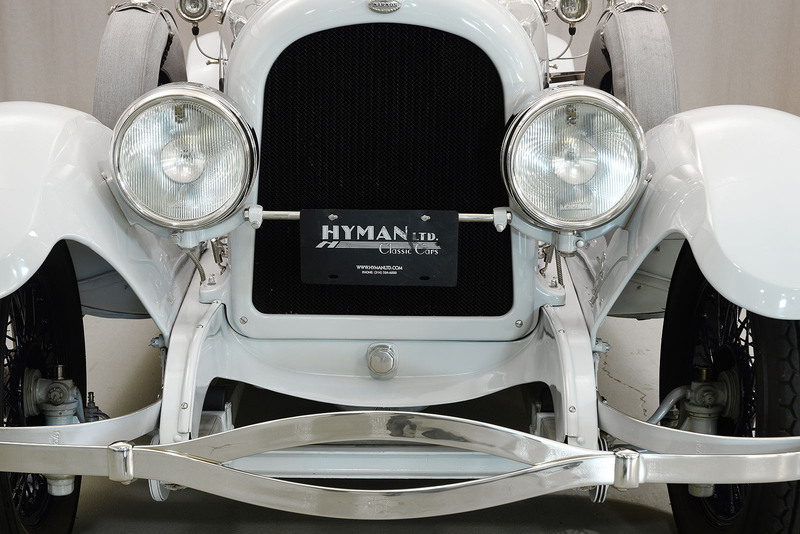 As a side project in a corner of his father’s workshop, he began work on his first automobile. 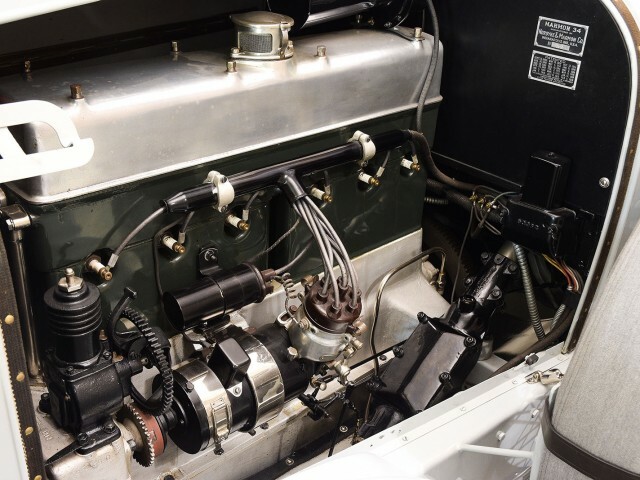 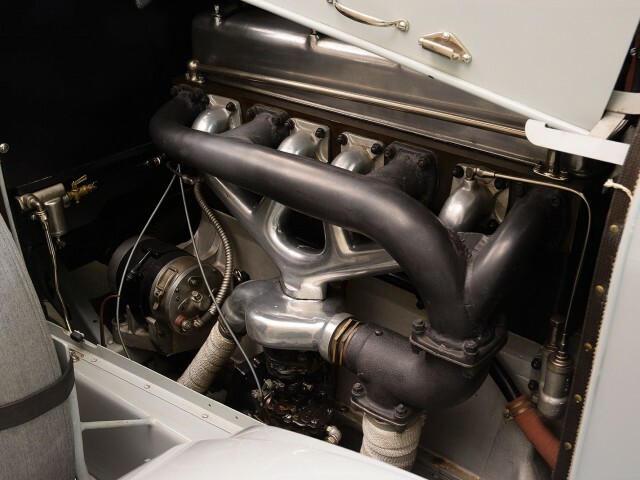 Howard Marmon was a very thoughtful engineer and he spent a great deal of time sorting out details such as an efficient lubrication system, which gave his engines the ability to sustain higher speeds than any other car of the era. 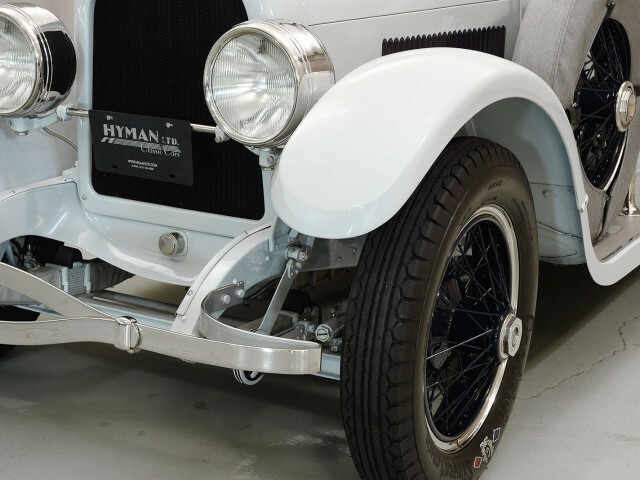 His first car proved a success and he quickly began to refine and evolve his designs as he sold more and more automobiles. 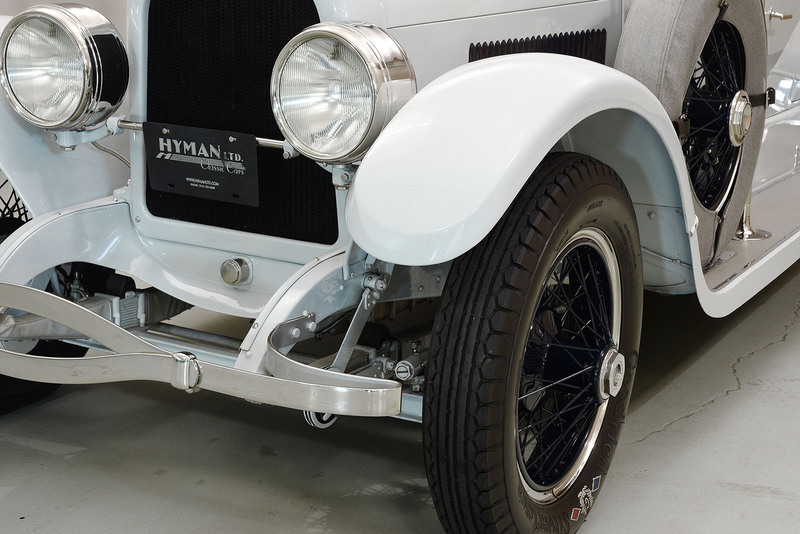 As the automotive side of the business grew, so did involvement in motorsport as a way to improve the breed. 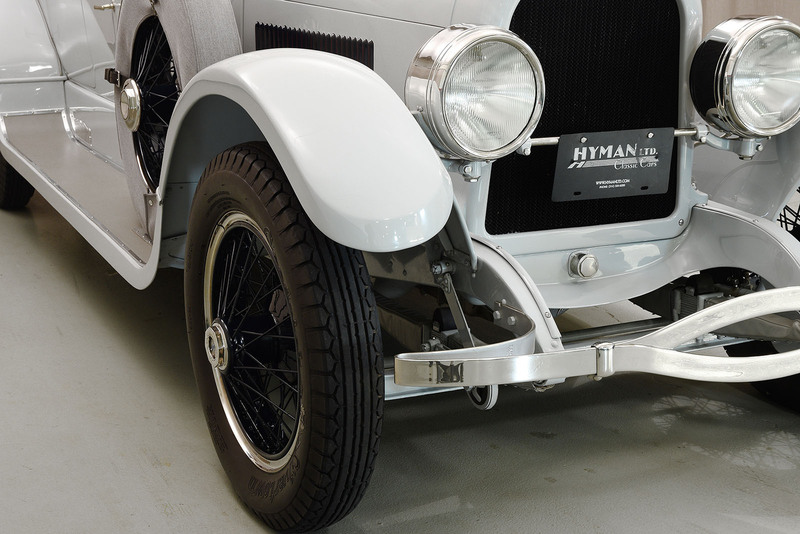 A Marmon engineer named Ray Harroun helped to develop, and drive, their most famous racing car – the “Wasp”. 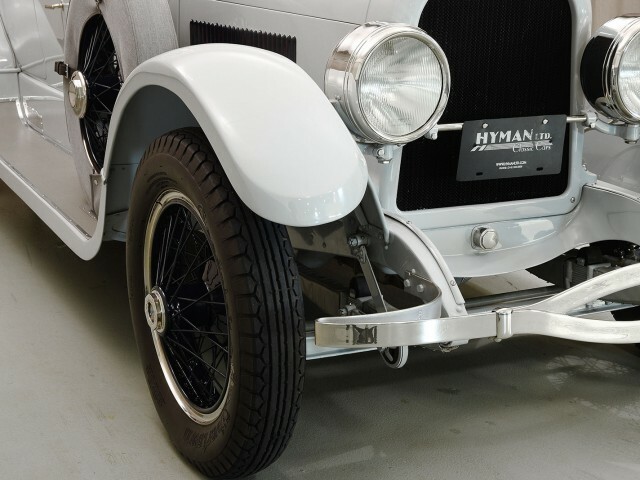 Mr. Harroun himself drove the Wasp to victory in the inaugural running of The Indianapolis 500 Mile Race. 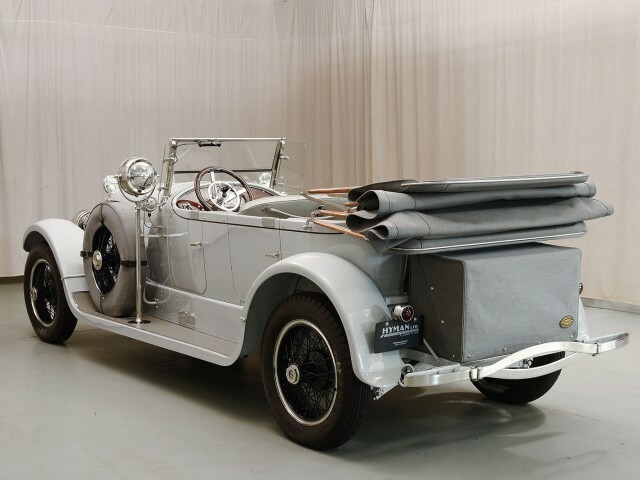 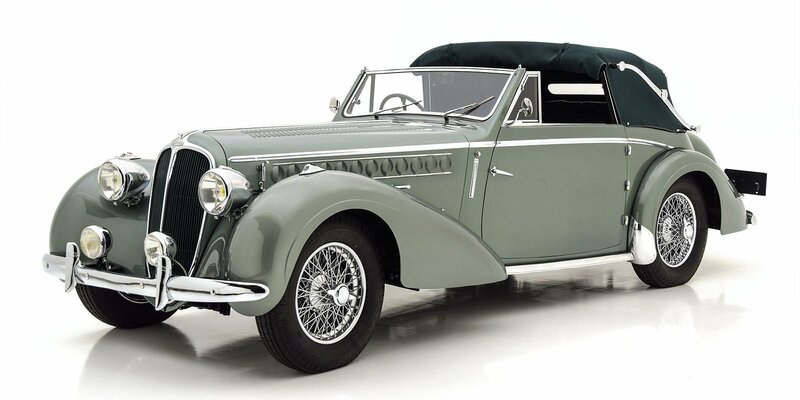 That set the stage for a run of very special automobiles that ranged from sporting roadsters and touring cars, eventually leading to the magnificent sixteen-cylinder cars of the 1930s. 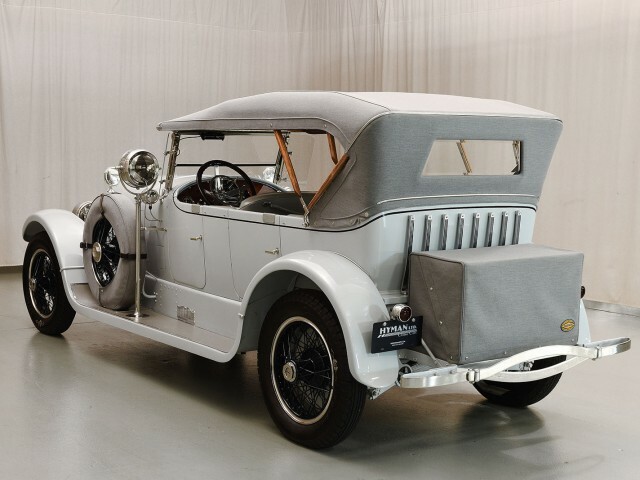 Sadly, Marmon’s place at the cutting-edge was short lived, as automobile production did not survive the great depression. 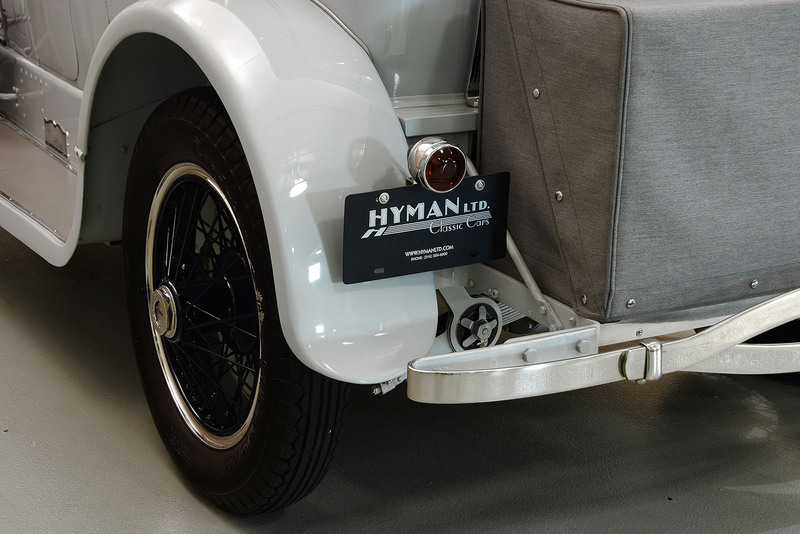 But the company did not disappear completely, as they evolved into Marmon-Herrington, a supplier of automotive and truck parts, as well as 4WD conversions. 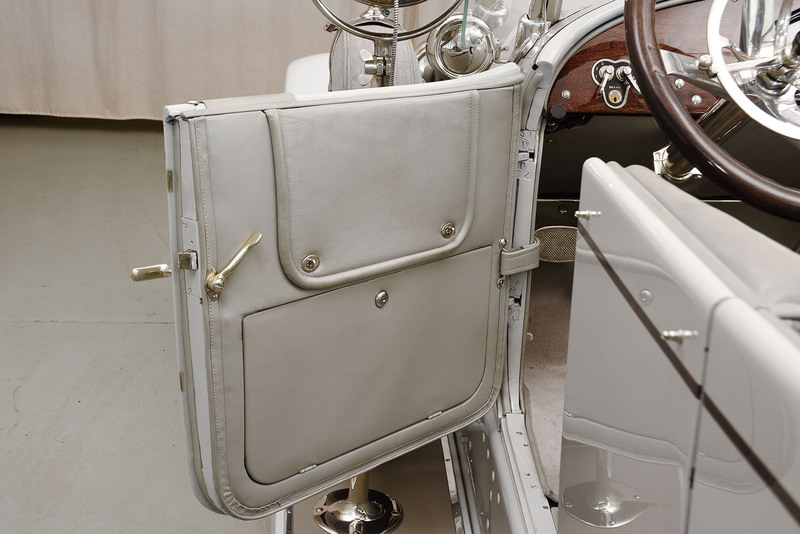 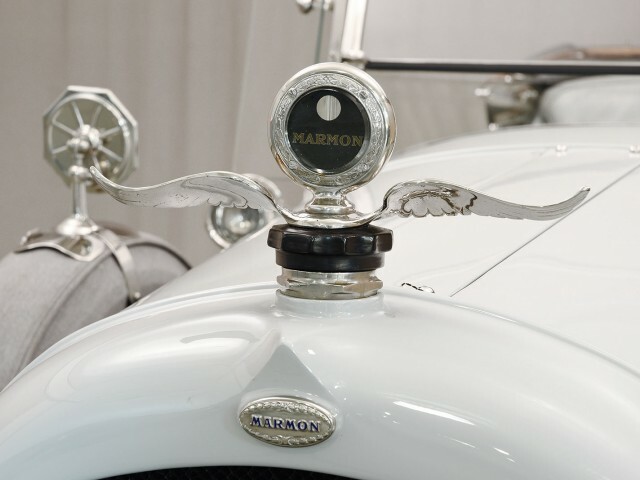 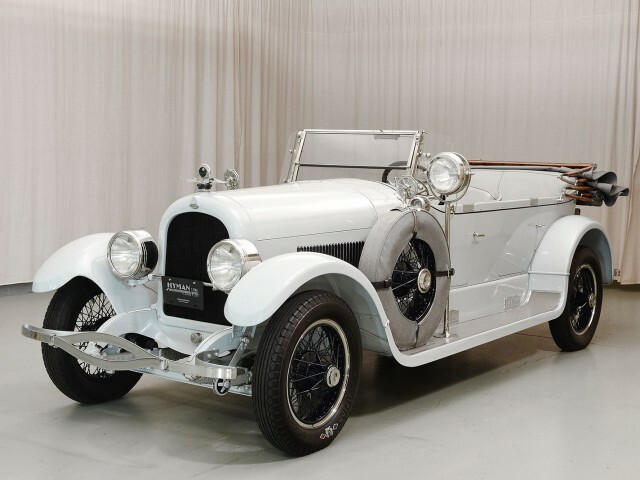 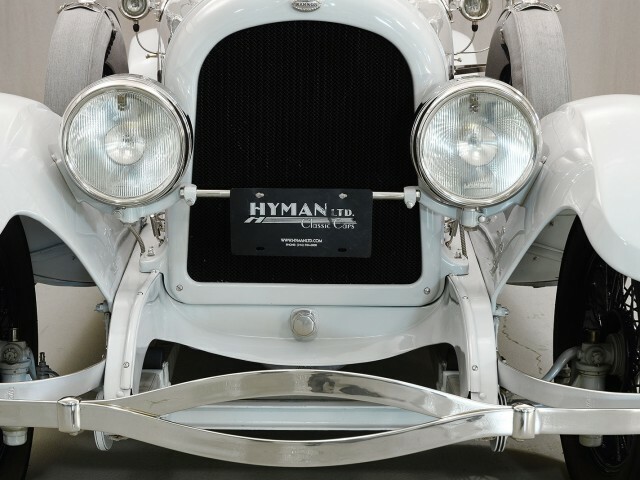 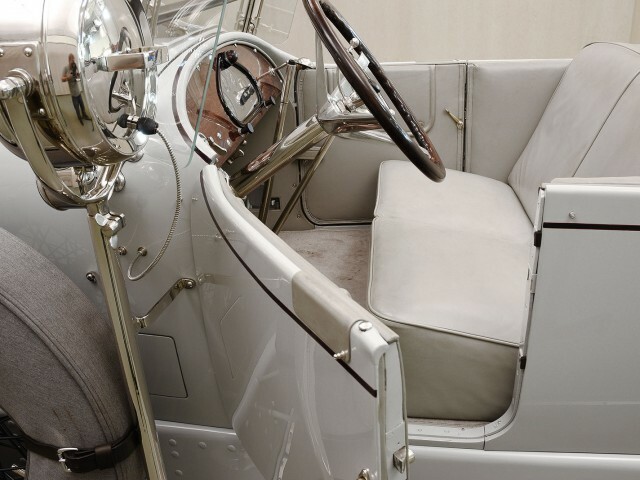 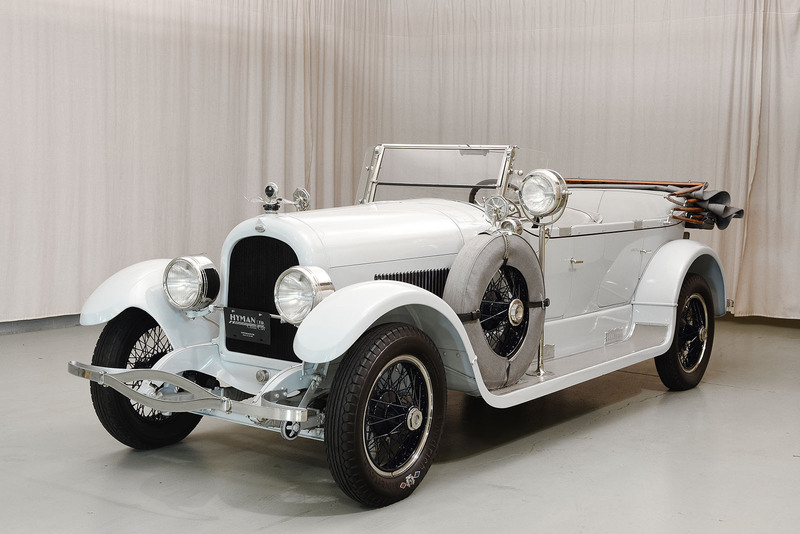 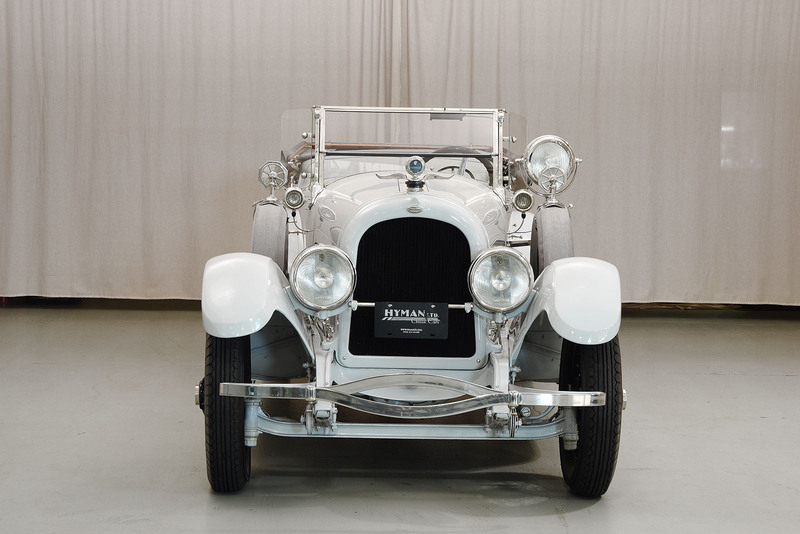 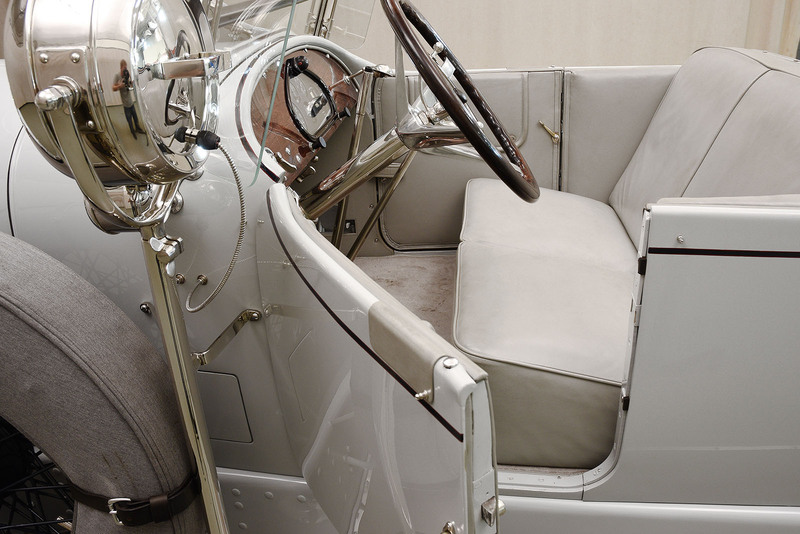 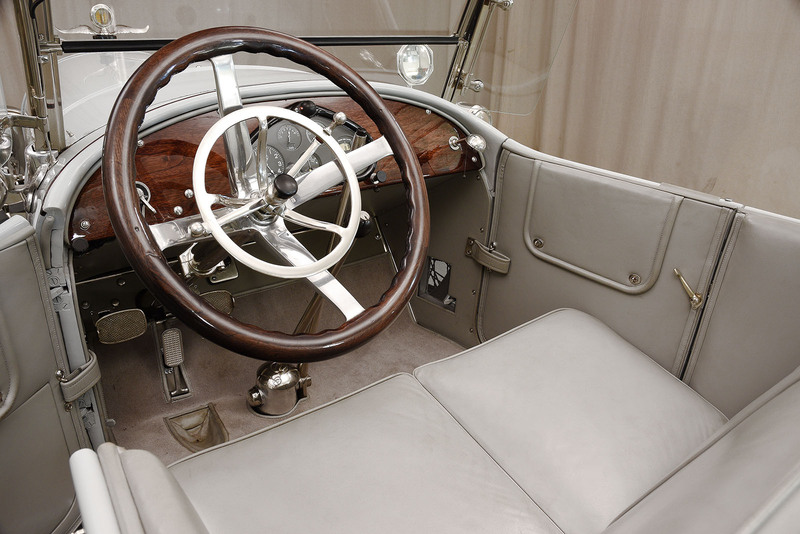 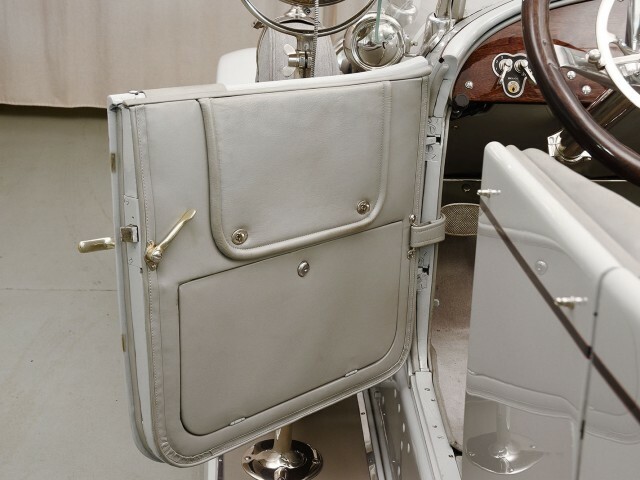 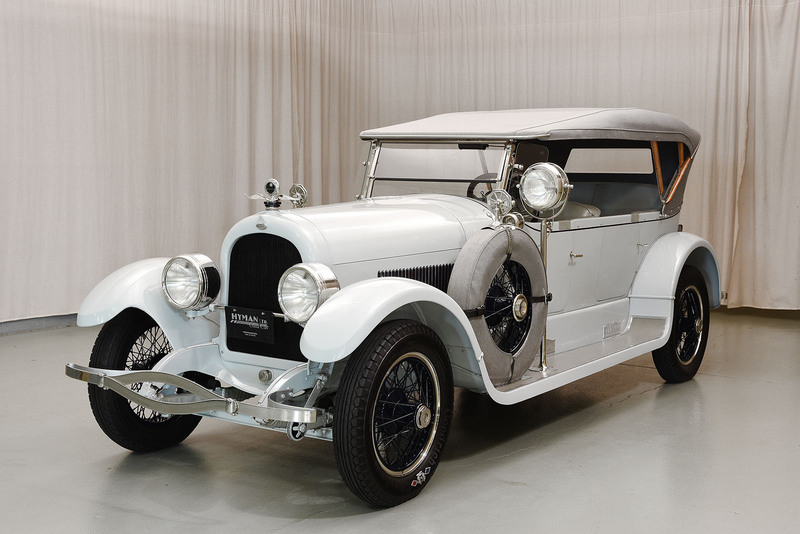 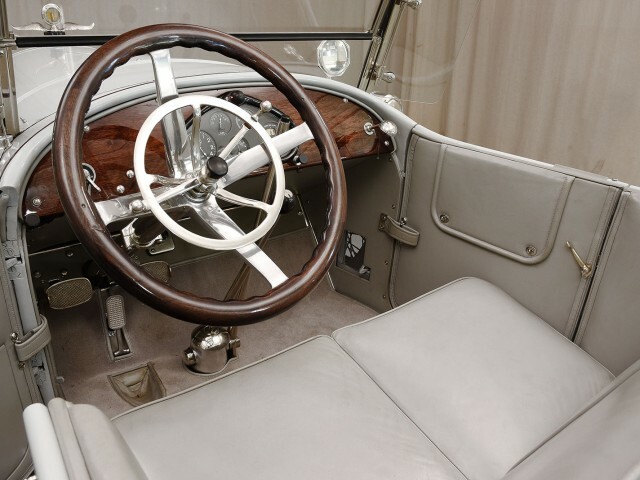 Thankfully, today’s enthusiasts recognize Marmon for their brilliance in engineering and these amazing automobiles are highly prized collector pieces. 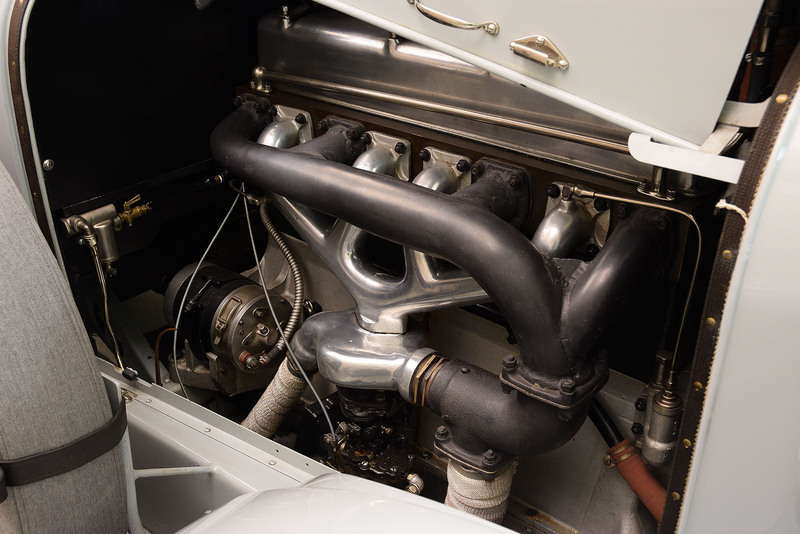 The Model 34B, as featured here, was inspired by the Wasp and fitted with a highly advanced 340 cubic-inch overhead-valve inline six. 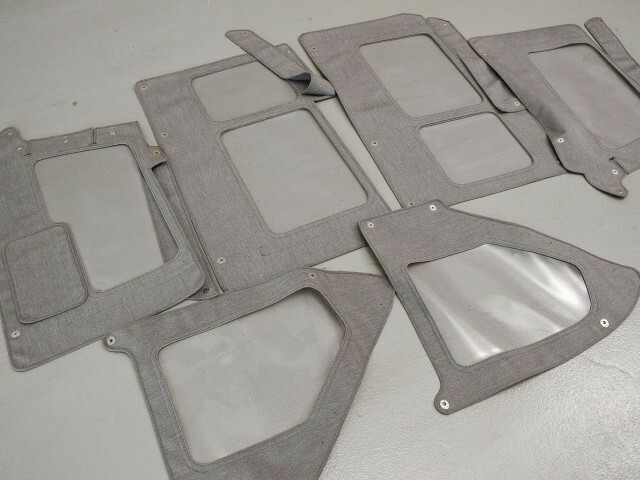 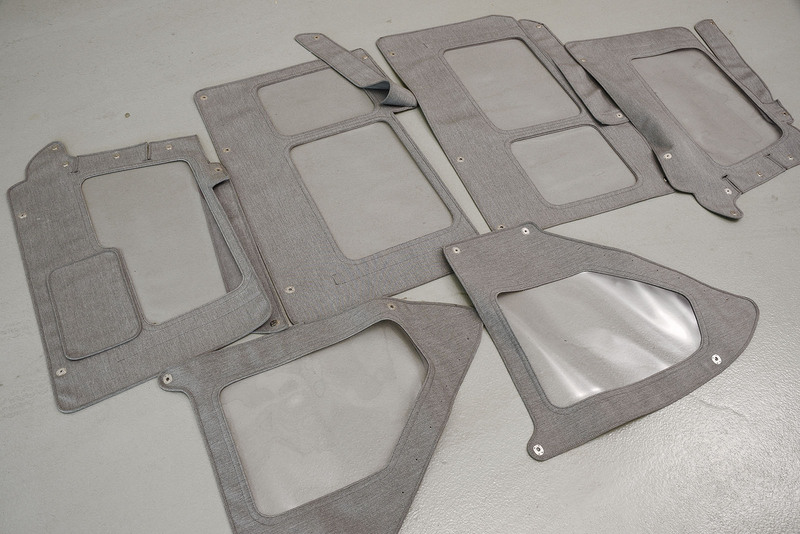 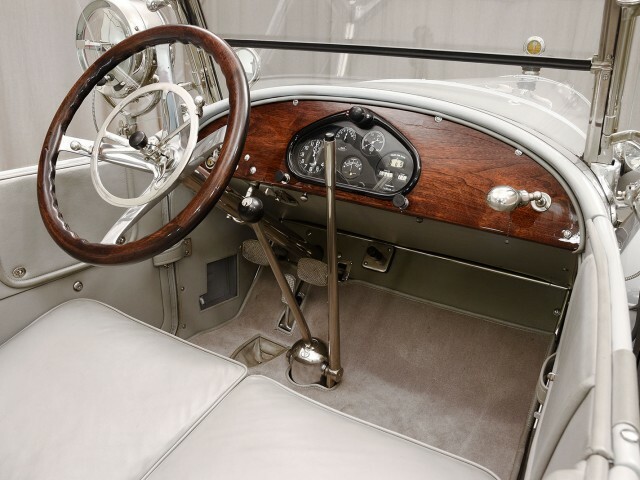 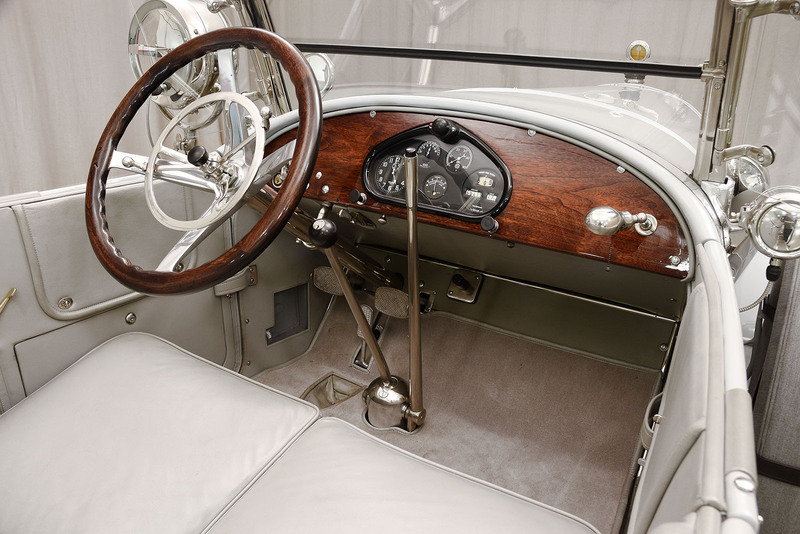 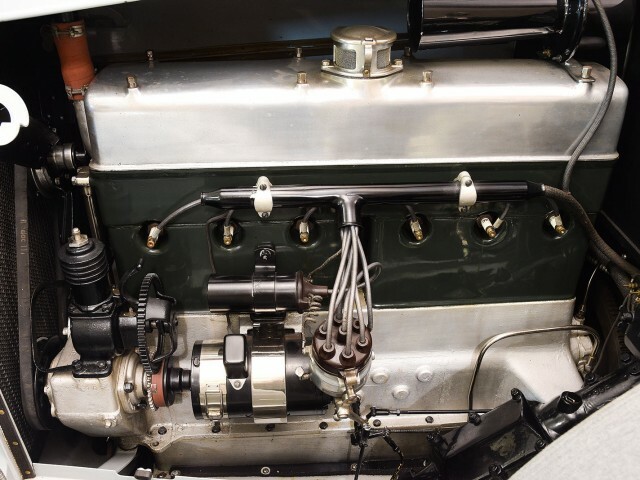 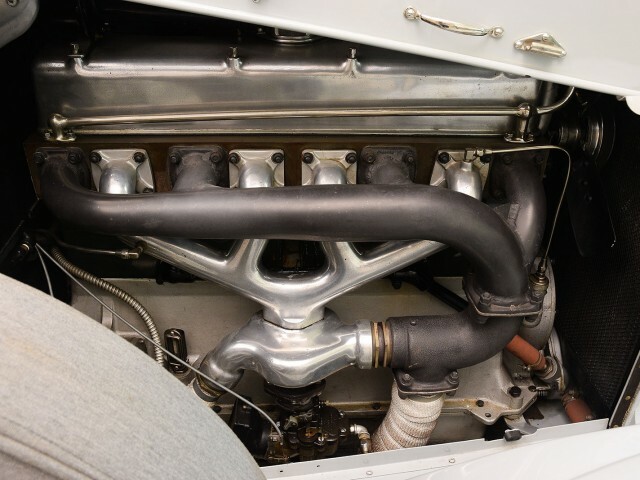 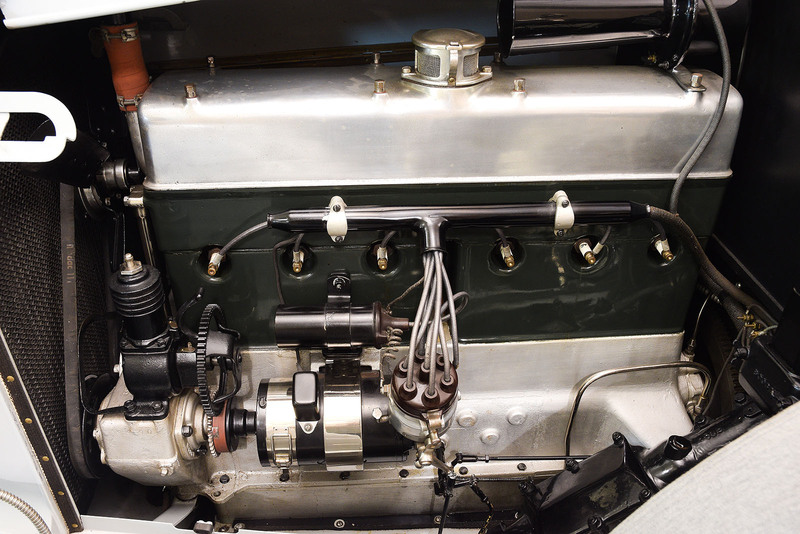 The Model 34B employed extensive use of aluminum both in the construction of the engine as well as the body, which kept weight much lower than its competitors and afforded the car exceptional performance for the period. 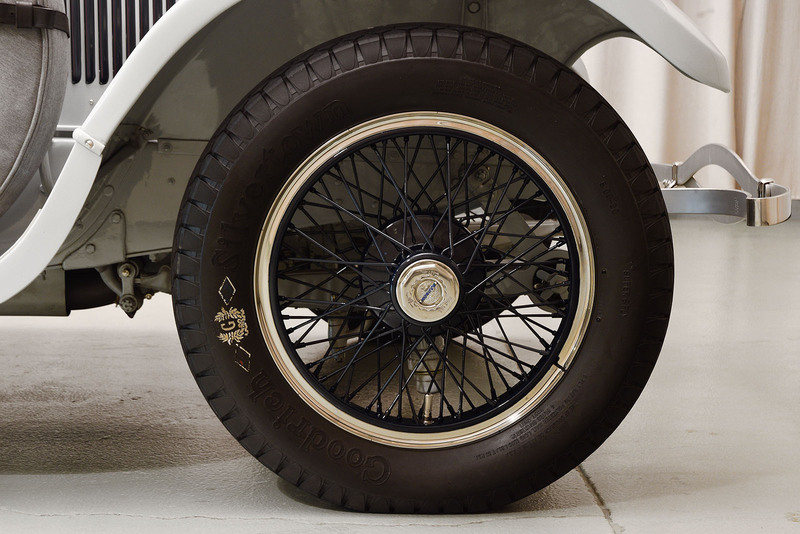 This stunning automobile rides on the standard 136 inch wheelbase, the only chassis option for the Model 34B. 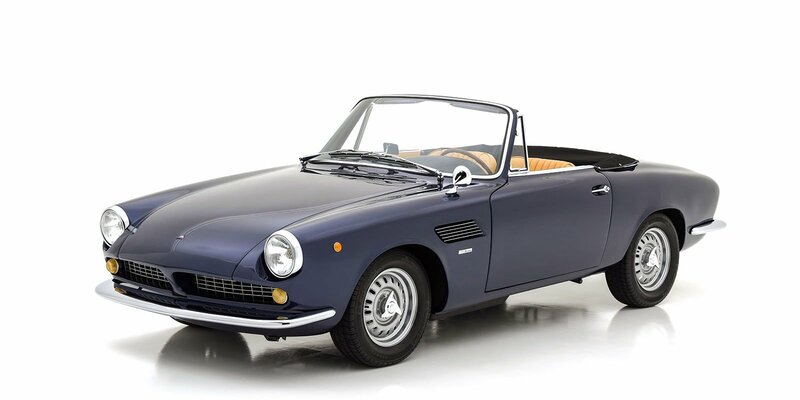 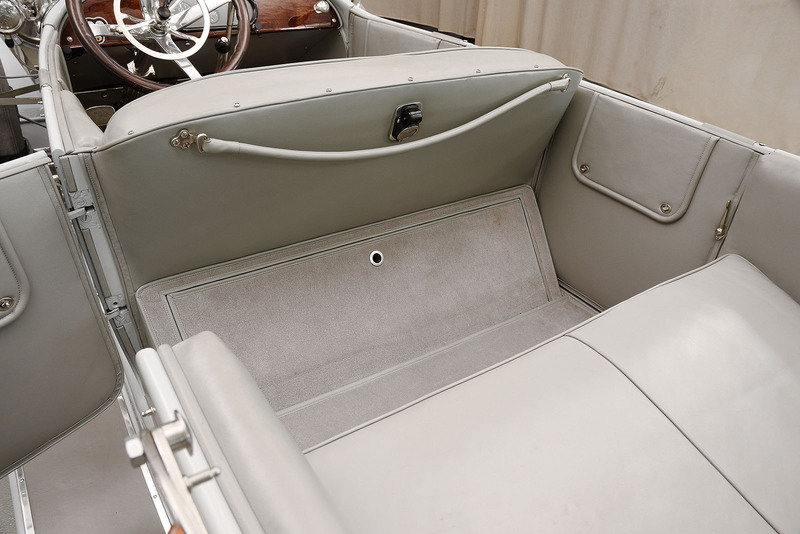 It wears a sporting and elegant four-door speedster body, with a rakish phaeton-style folding top and laid back windscreen. 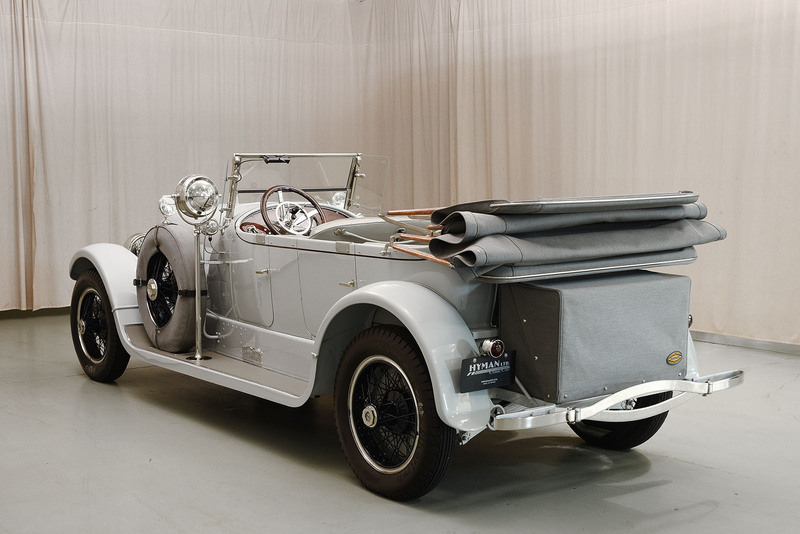 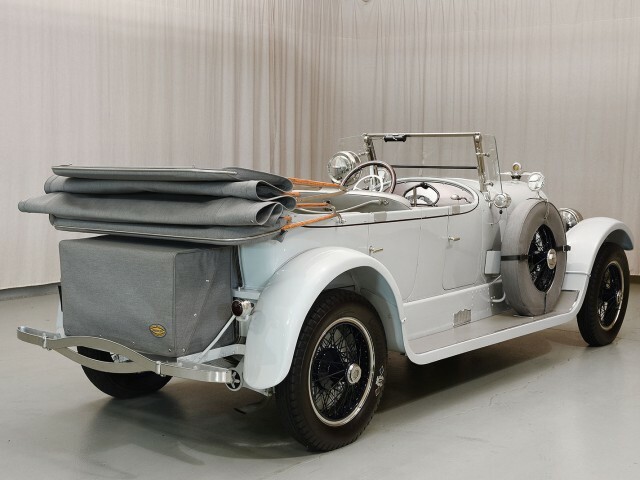 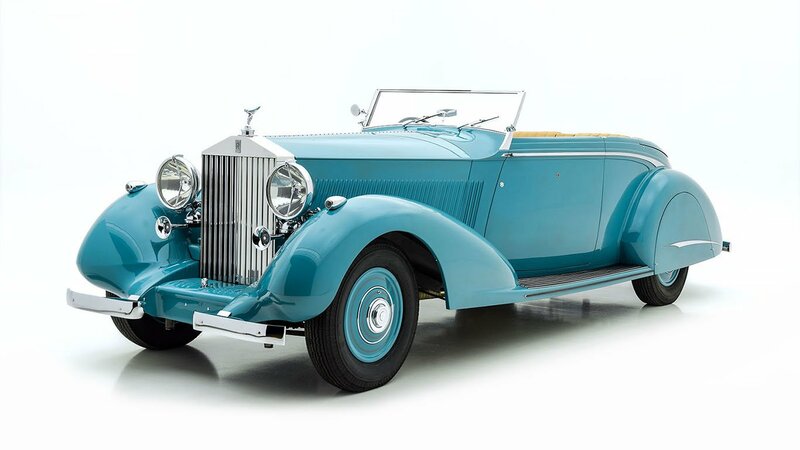 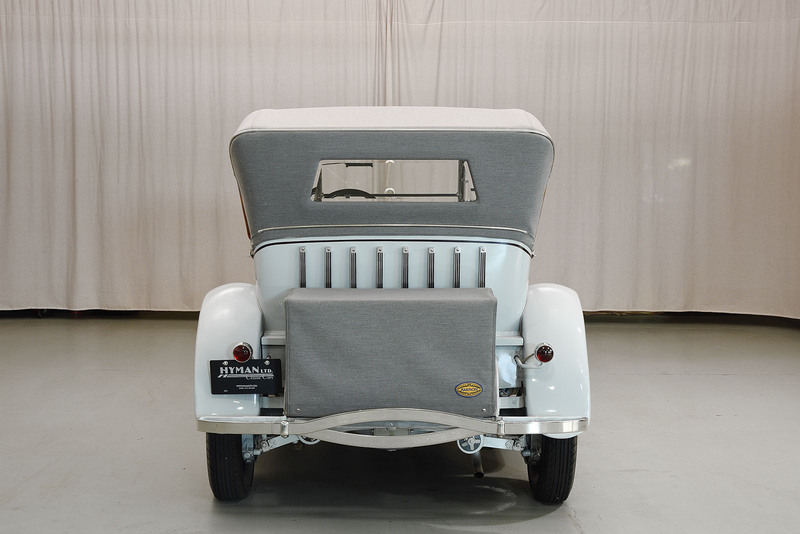 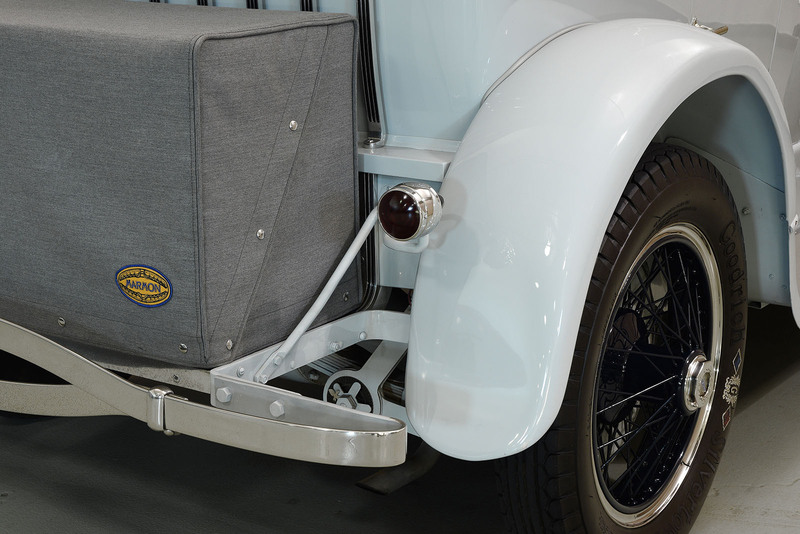 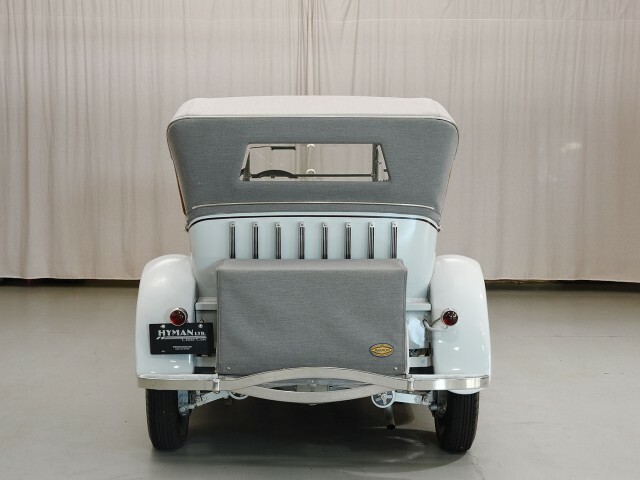 The body, finished in a pleasing light bluish-gray, has been restored to world-class standards with exceptional fit, finish and top-level concours quality paintwork; performed by the vintage and veteran car experts at Robinson Restorations of Schwenksville, Pennsylvania. 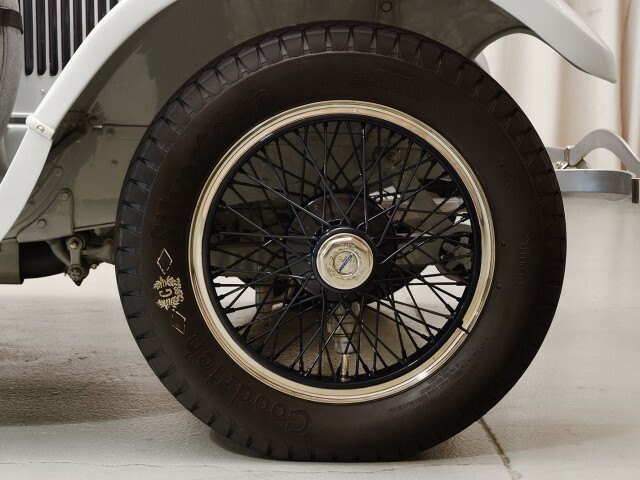 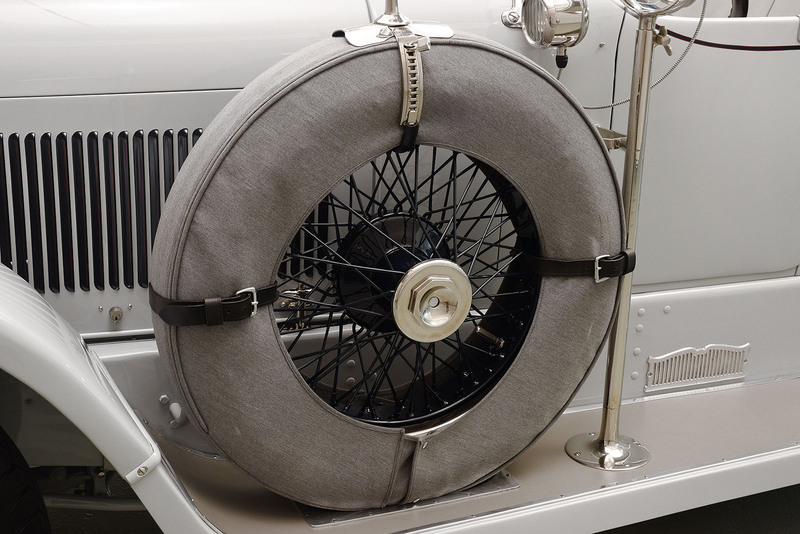 Six dark blue wheels with period correct black wall tires add an unmistakable sporting touch to the coachwork. Beautifully polished and factory-correct nickel plating can be found on the bumpers, wheel nuts, wheel trims, mirrors, windscreen, lamps and fittings. 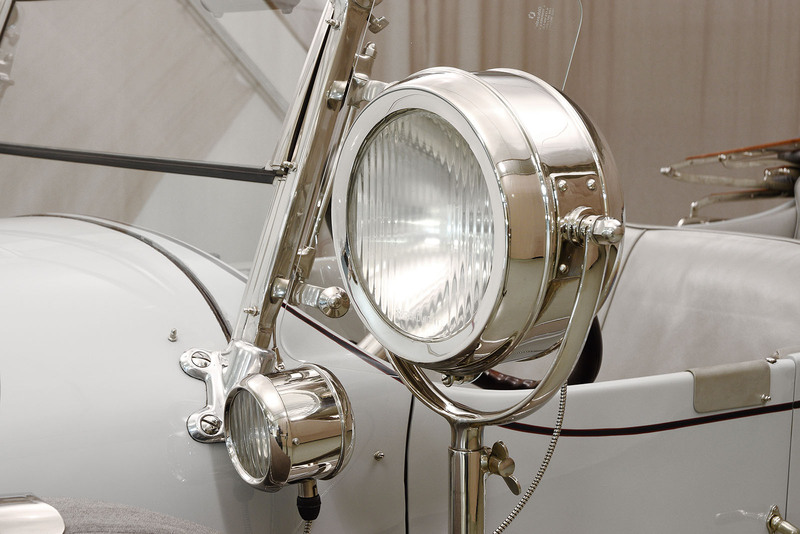 A pair of drum-type cowl lamps echoes the large drum headlamps, all of which have been meticulously restored. 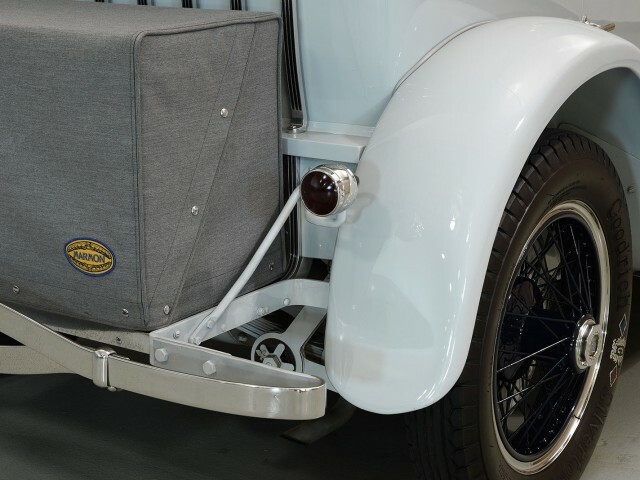 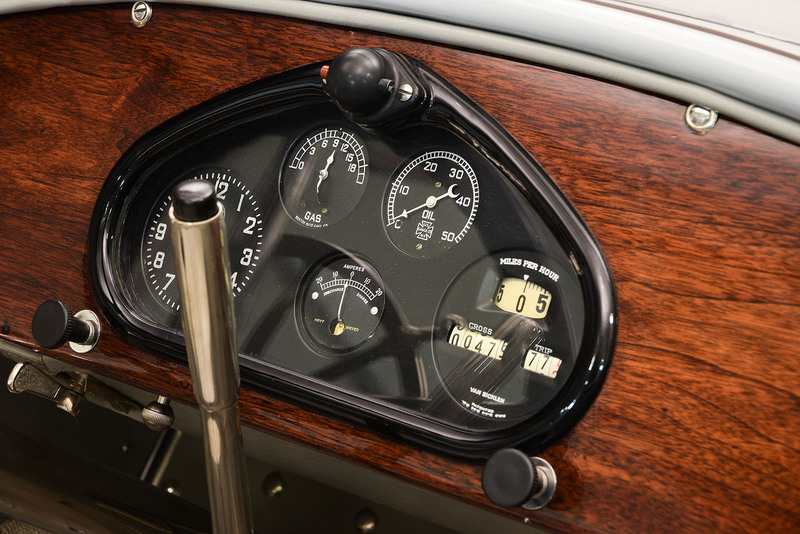 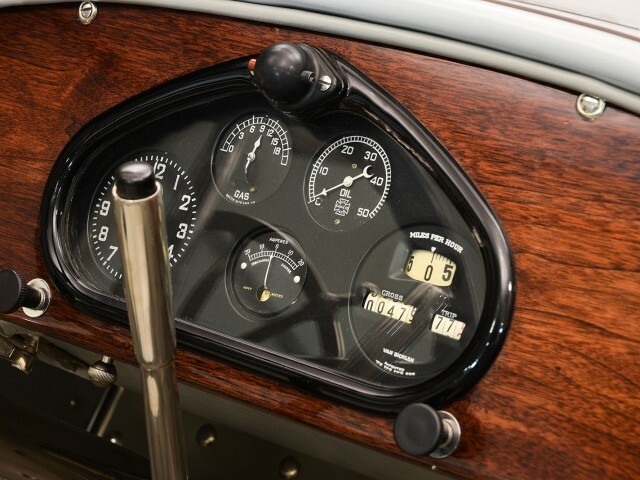 Mounted to the driver’s running board is a huge, fantastic vintage Spreadlight search lamp and a correct Marmon-branded Moto-Meter adorns the top of the radiator. 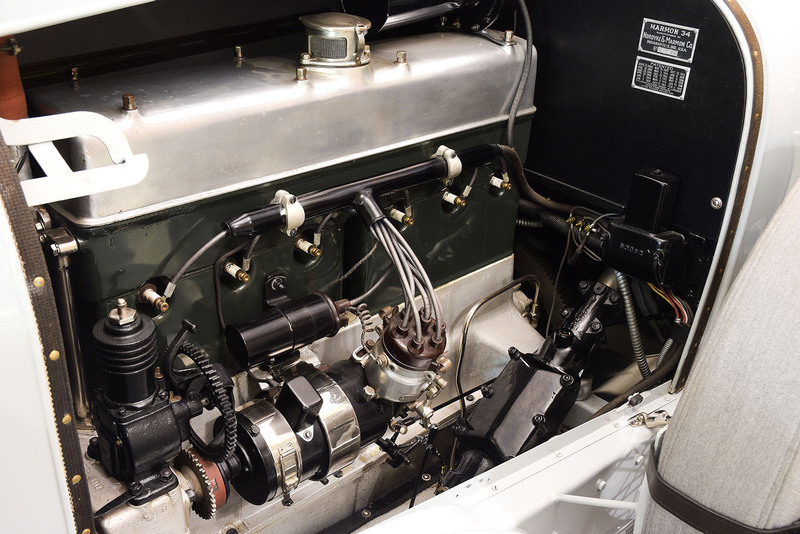 The engine even features an on-board air-compressor which can be manually engaged in an emergency; a thoughtful and brilliant touch courtesy of Howard Marmon. 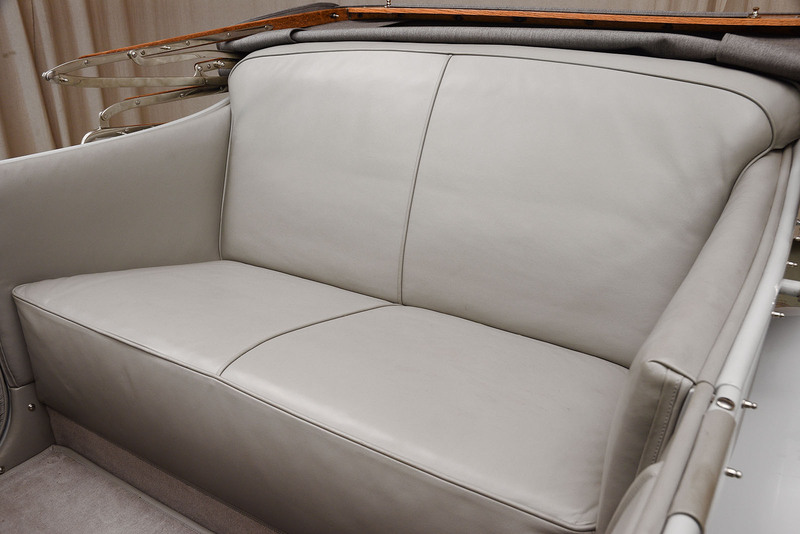 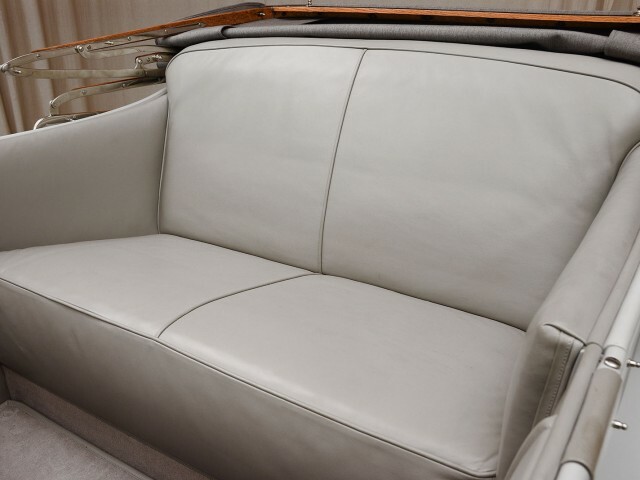 Beautiful gray leather and carpets have been expertly fitted and the luxurious cabin is accented with gorgeous wood and nickel work, all of which appears fresh and virtually flawless. 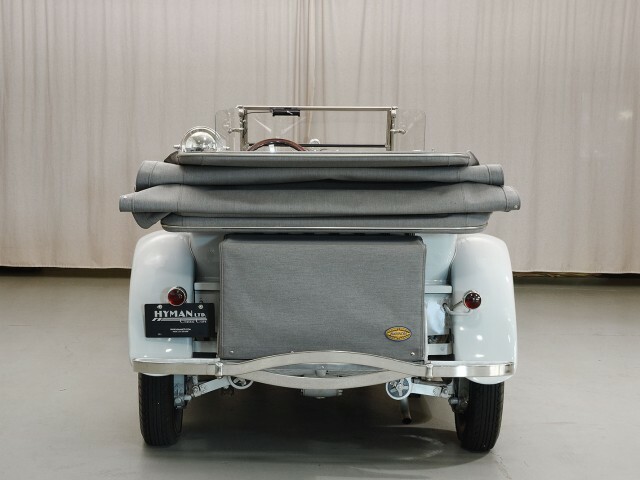 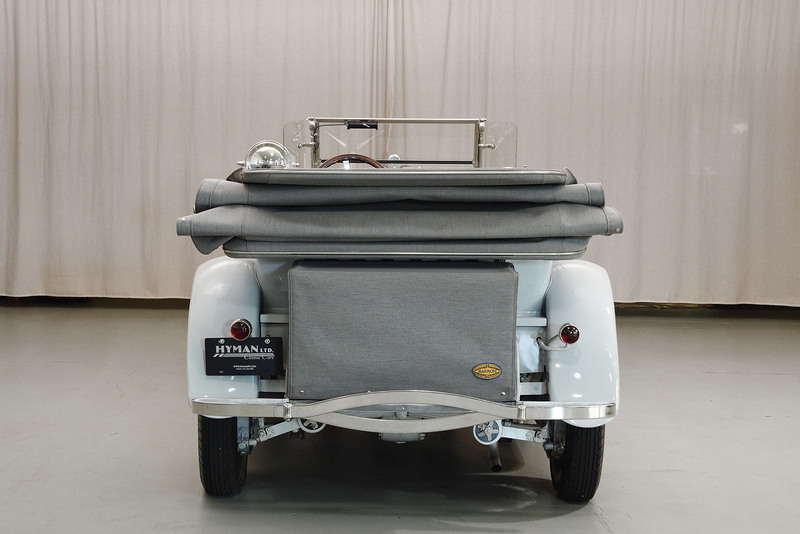 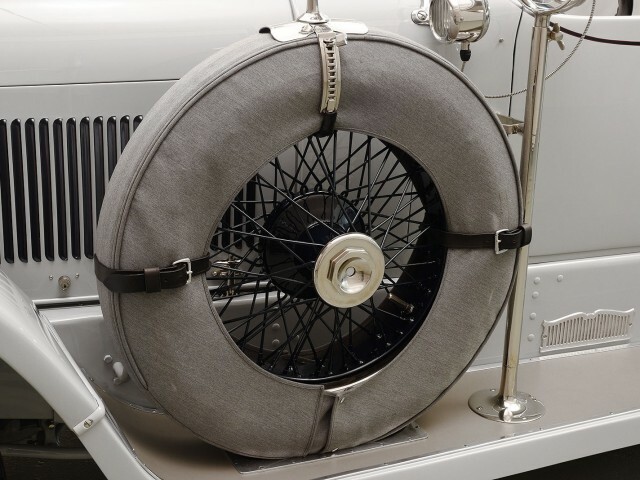 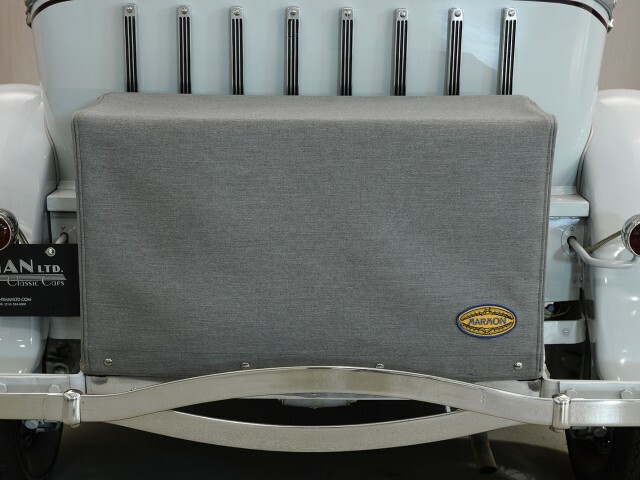 The neutral gray leather is complemented by a dark gray canvas top, trunk cover, and side mount spare wheel covers, balancing out the unusual but beautiful color scheme appropriately. 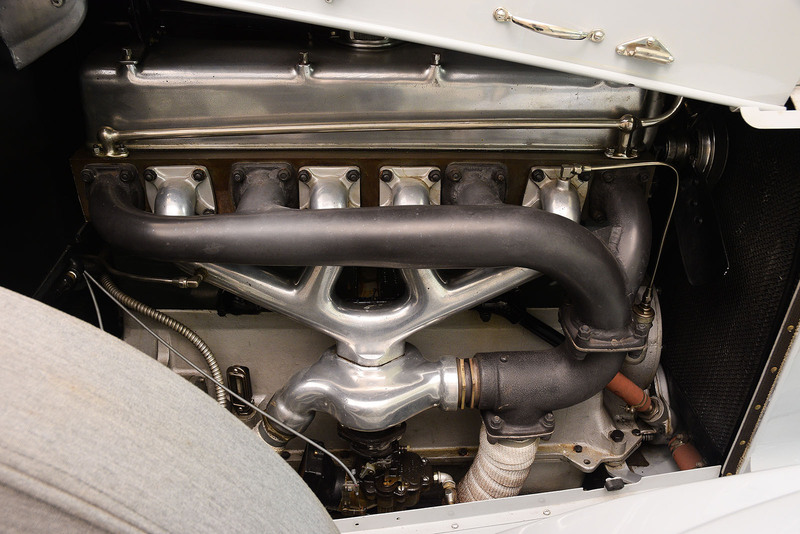 From top to bottom, this automobile has been fastidiously restored with not a nut or bolt left unturned. 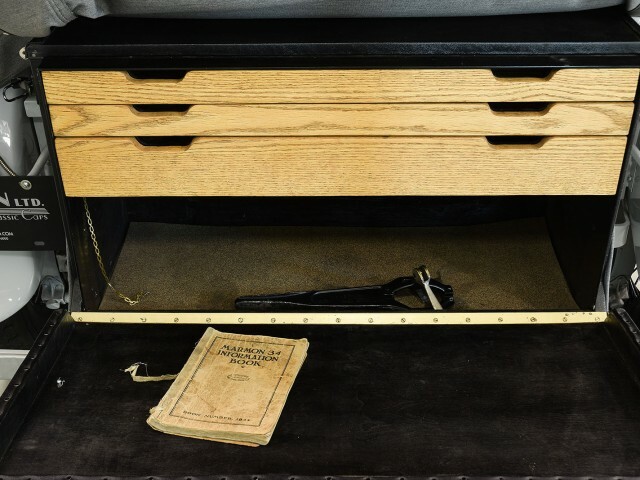 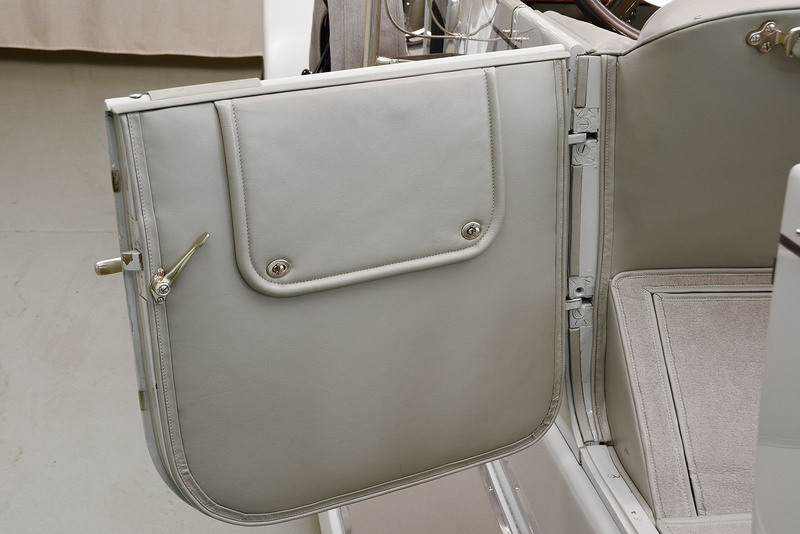 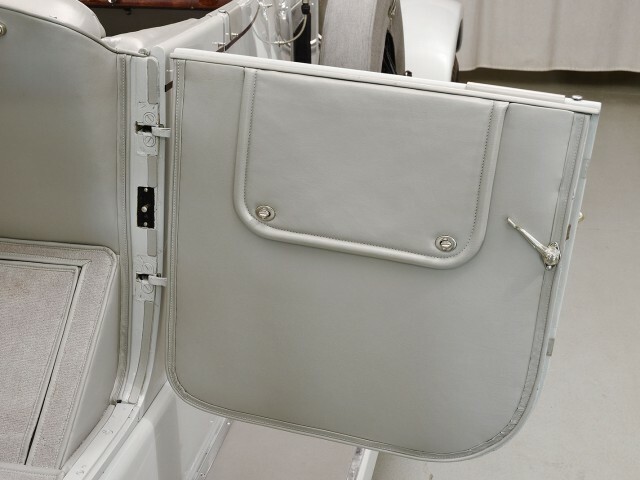 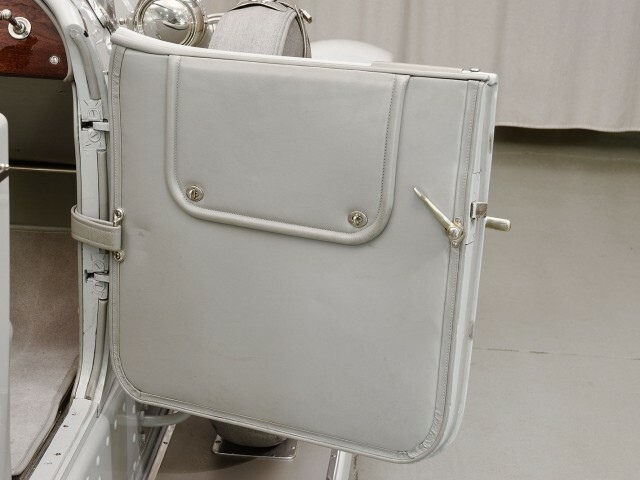 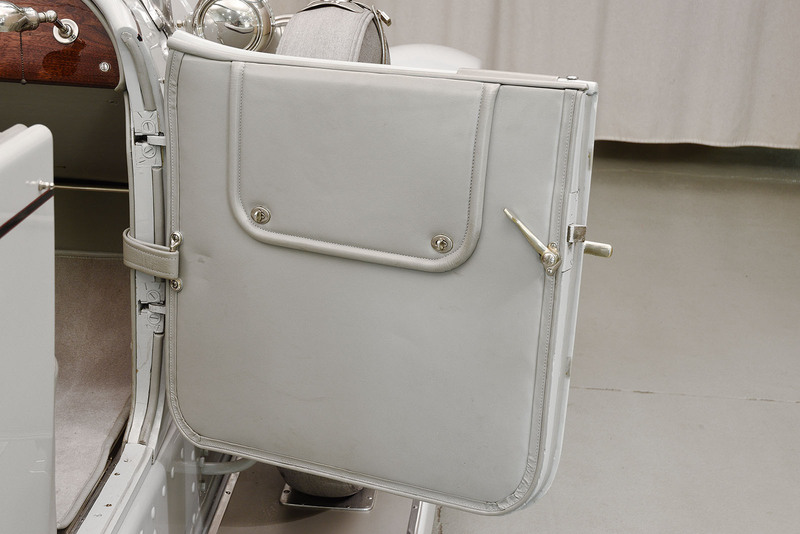 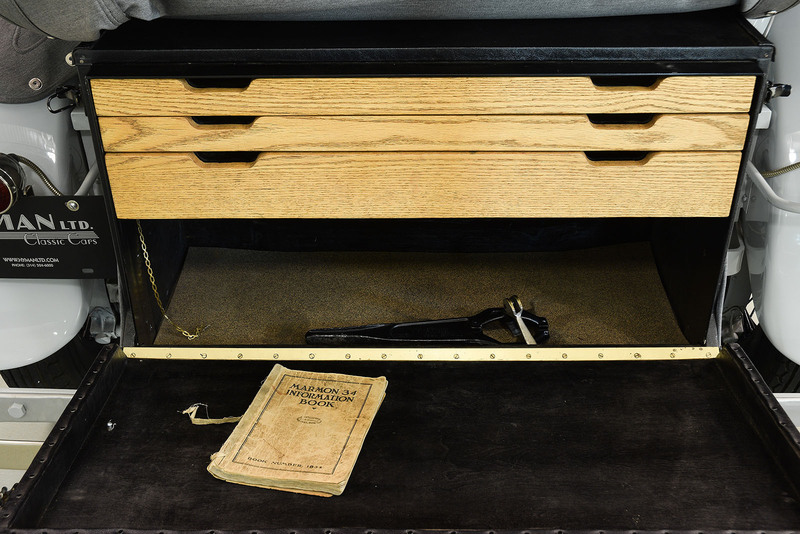 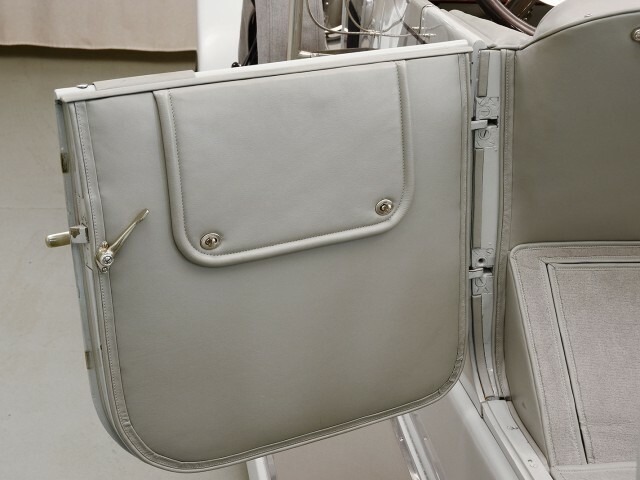 The undercarriage and engine compartment have been exquisitely detailed with correct finishes, fittings and hardware. 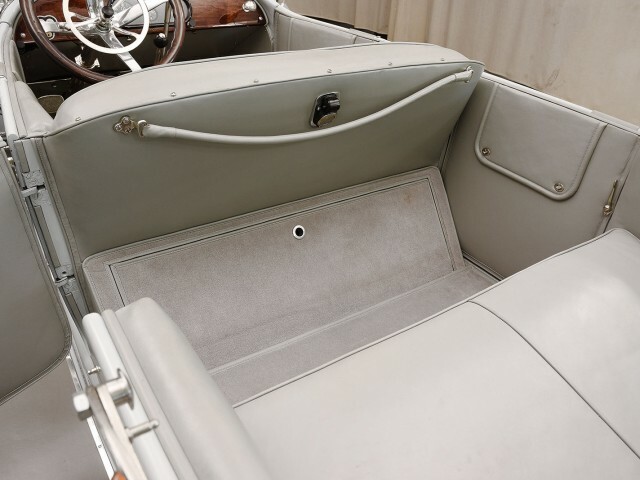 It is absolutely fresh and ready for show, exhibiting almost no use since completion. 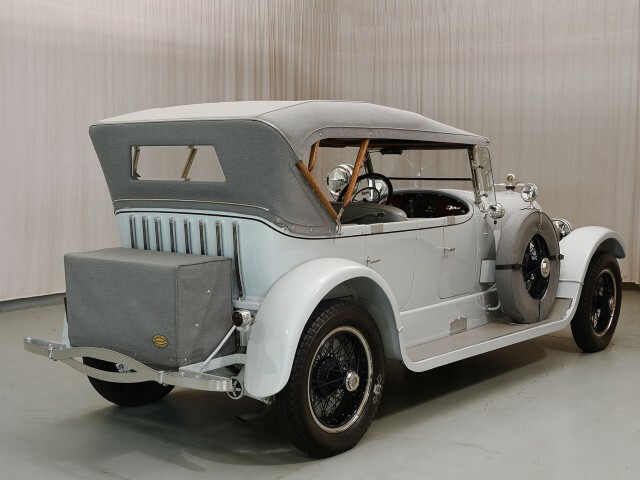 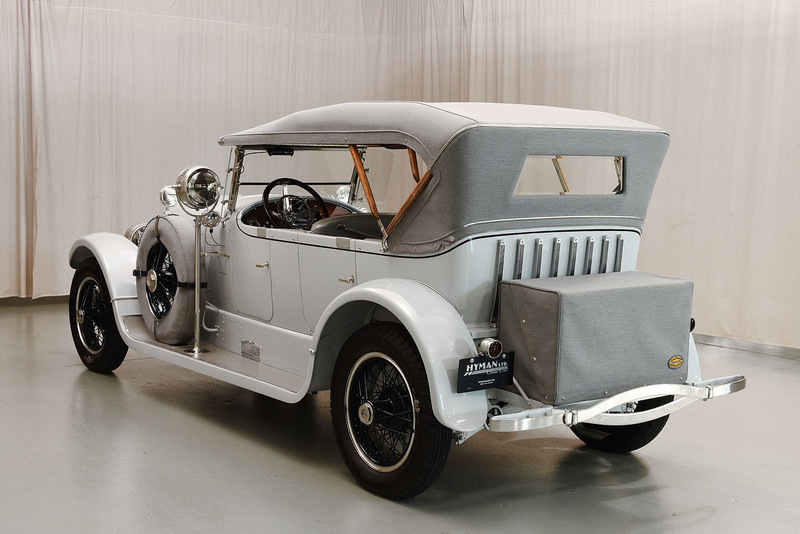 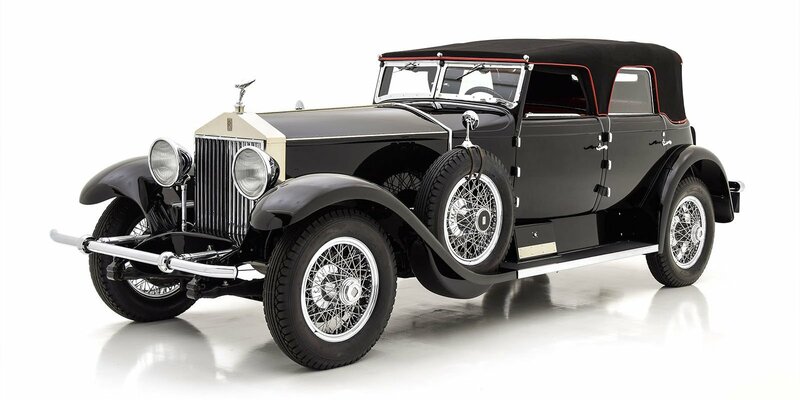 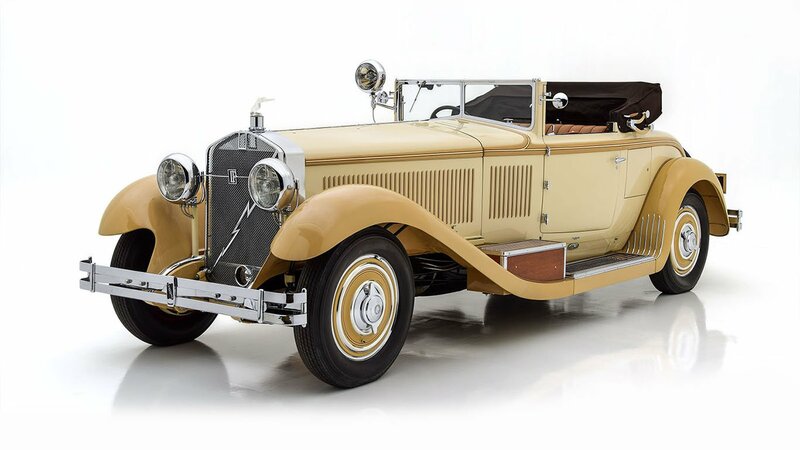 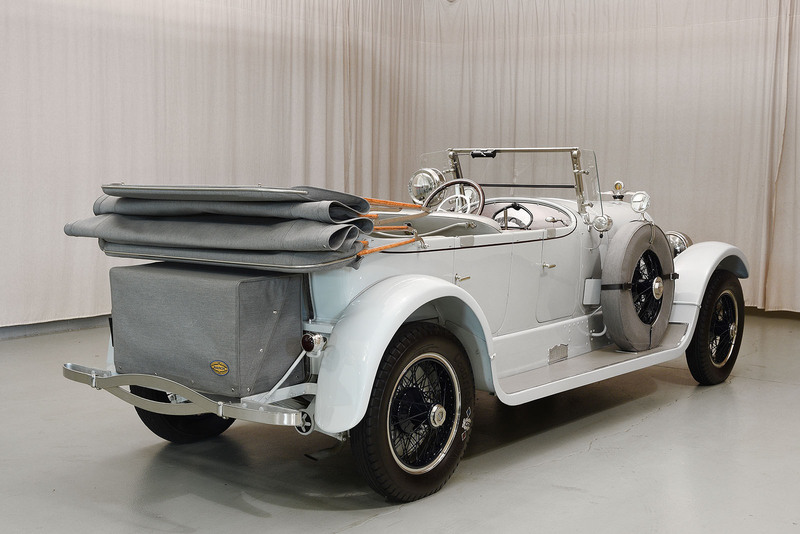 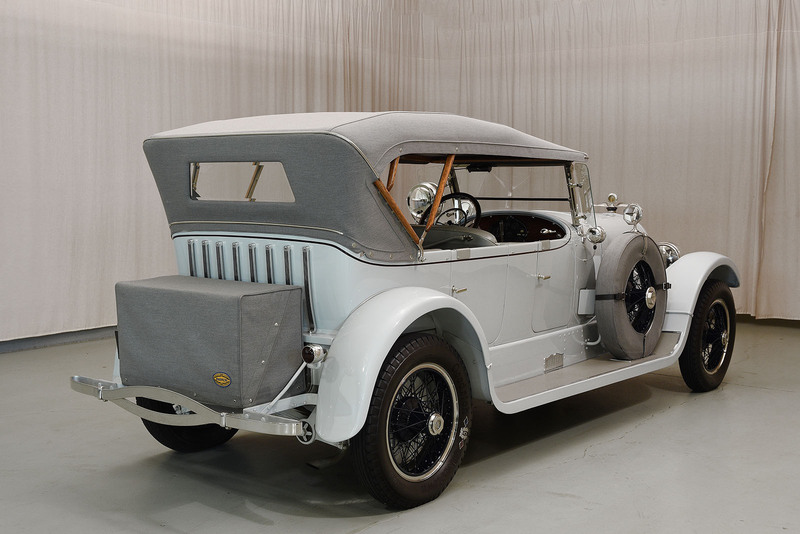 Of exceptional style and exceptional character, this rare and desirable Marmon 34B is a concours quality automobile in the truest sense of the term.